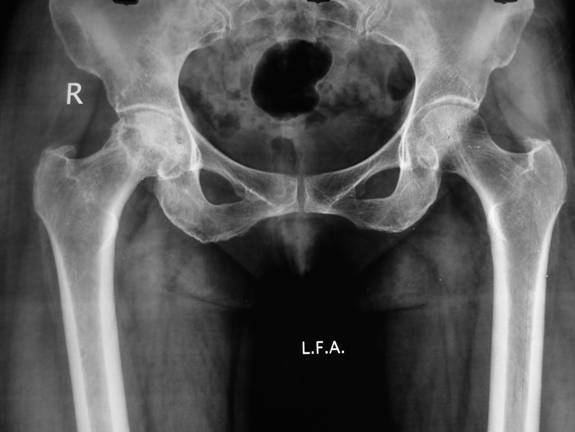 This patient also has a fracture line – a right capital femoral head fracture. Both of these need urgent surgical intervention. This will be my primary ( most likely) diagnosis. This patient also has generalized osteopenia of the bones. Steroid induced osteoporosis will be my tertiary diagnosis after steroid induced osteonecrosis. 10% of lupus patients develop osteonecrosis from long term use of steroids. Lupus arthritis itself presents very similar to rheumatoid arthritis.- symmetrical distribution, hands and wrist more affected, early morning stiffness but the symptoms are less severe. This presentation is highly non-diagnostic. Osteoarthritis? Even with mild or early changes like subchondrial sclerosis, this diagnosis is far away on the list. A fracture can also narrow a joint space. Many key findings are missing in the xray, the most reliable of which would be bone spurs (osteophytes) in this case. Even with this finding, this would not be the primary, secondary or tertiary diagnosis based on therapeutic priority. Osteosarcoma? This is like looking for a needle in a haystack. It is very rare in this age group. And there is no diagnostic history. And there are counter-diagnostic findings on x-ray. ( no periosteal elevation, no soft tissue calcifications, grossly normal cortical and medullary surfaces).